There are certain elements that turn up time and time again in many Asian homes. Many of these features can be traced back to ancient philosophies and creative quite a distinctive, calming aesthetic. 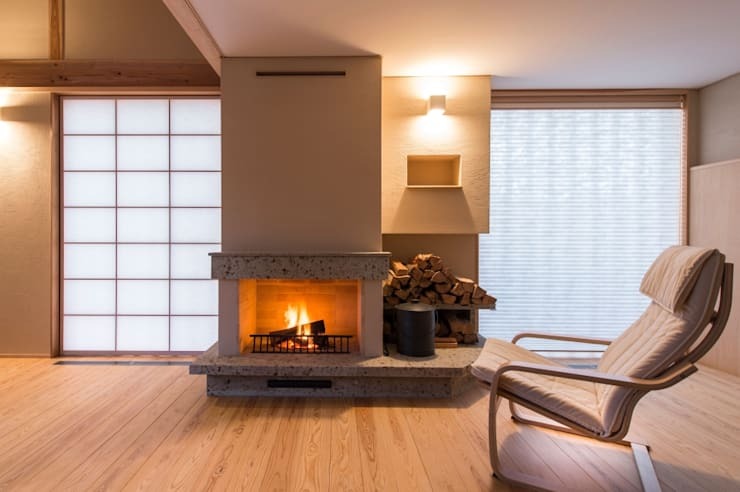 So what are the elements that make up the perfect Asian home? 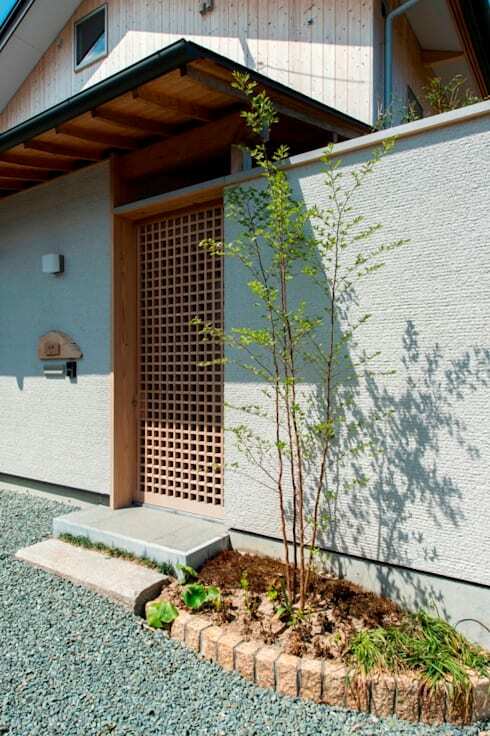 Well, today we’ll explore a Japanese dwelling that ticks quite a few boxes. 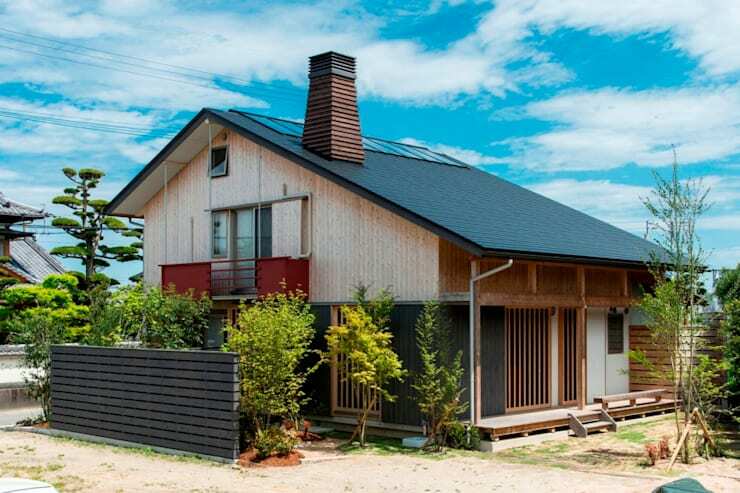 The two level home has a sloping black roof that reaches down to almost the roof level of the first floor. 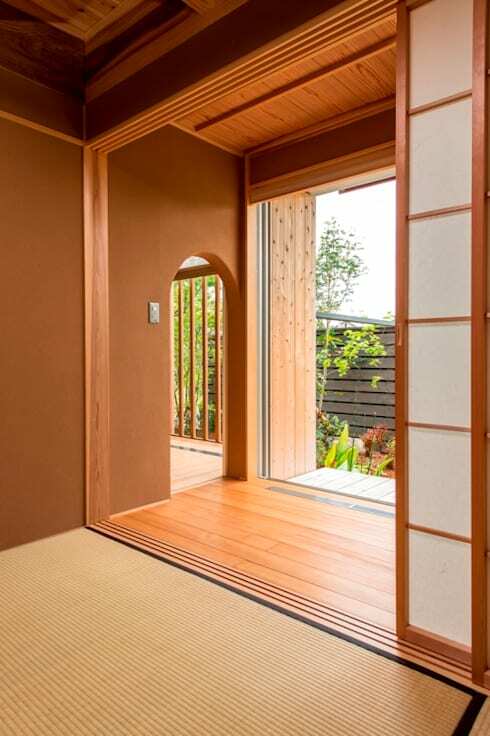 It also has a series of wooden screens on the street facing frontage and both elements serve to create a very private facade. On the side exterior as you can see the home is far more open and this invites lots of natural light into the big open interior. There are multiple small terraces or porch areas in this home. They have a very minimalist design and there is no need for outdoor furniture. Instead, we have a naturally comfortable wooden deck that could also provide informal seating. This low-key approach of course helps the natural surroundings remain the real focus. The interior is designed as a great big open space of double height. The support beams are all exposed and there is a luxurious, slightly raw quality about the aesthetic. Timber flooring, timber window frames and a big open fireplace complete the rustic effect. Note how the elements all have a neutral colour theme that reflects the colours of nature. The standout feature in this home is definitely the bathroom. It has been designed to look out onto this rather private little high-walled garden area. 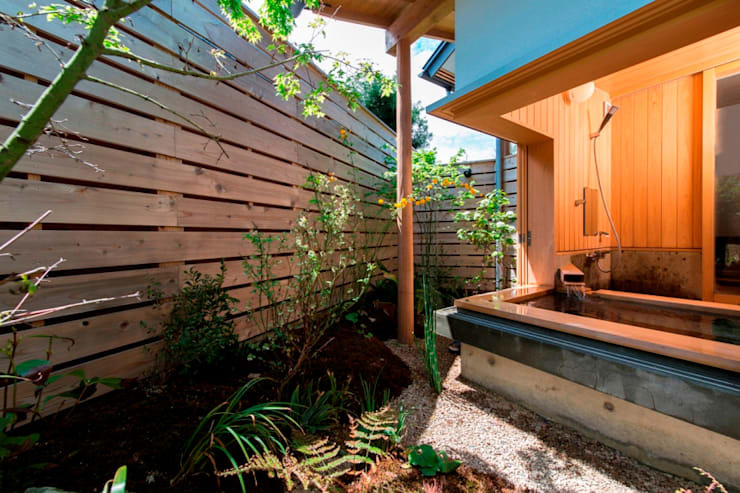 Two sides of the bathroom actually open up completely so one can feel totally immersed in the natural surroundings. 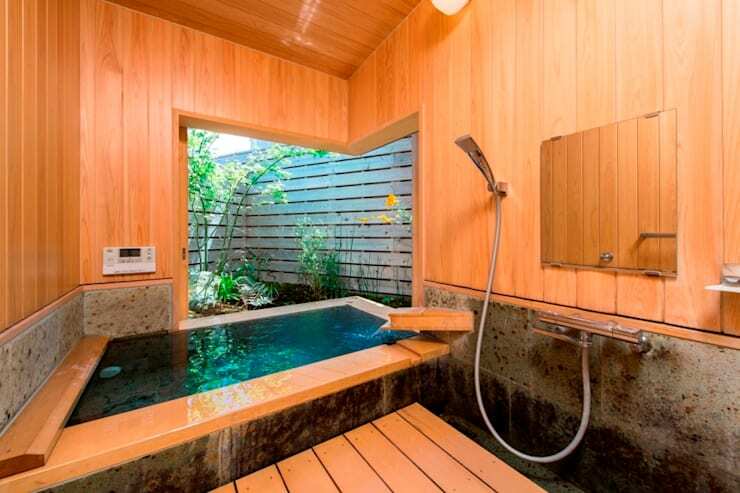 We'll look at this naturally luxurious bathroom more a bit later. Although this is a home of relatively impressive proportions and vision, the home still has all the trademarks of a Zen style aesthetic. A simple sapling creates a gentle look to this entrance area and the quiet combination of patterns and shadows complete the look. The warm and cosy appeal of the fireplace has a central role in the open plan living area. Many living rooms are designed around a television, but we feel this provides a far more appealing, calming feel to the home. Note how the fireplace structure also serves to separate the living area into different zones. Here we have another glimpse of the fireplace and an excellent picture of how cosy and comfortable this home would be during winter. 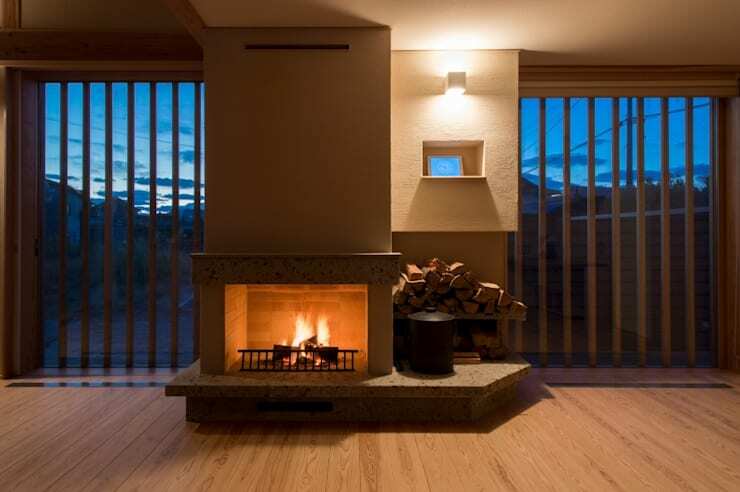 The evening view through the big glass doors really shows how nature can become a key part of the interior decor. Here we have an excellent view of the timber bathroom in all its' glory. Pale timber covers the floors, walls and ceilings, but of course, the real eye-catcher is the big deep bath that could even be described as an indoor pool. 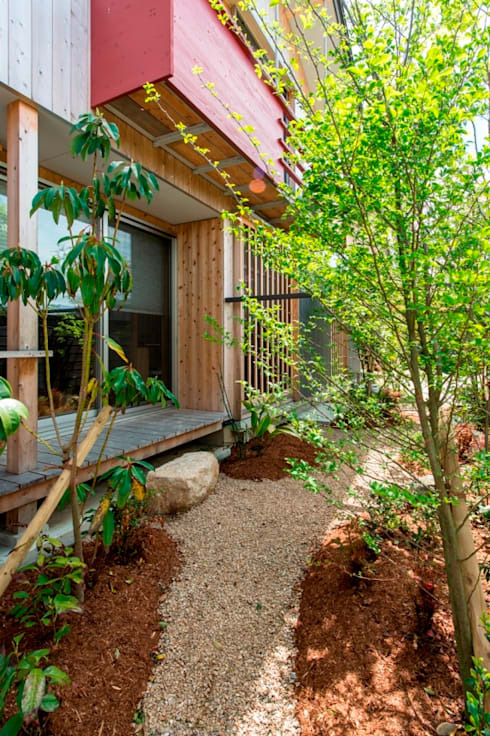 The natural materials combined with a private garden view are a real winner. Finally, we'll take another look at the minimalist elements in the home. Here in this small passageway, we get a sense of the attention to detail in the finest elements. 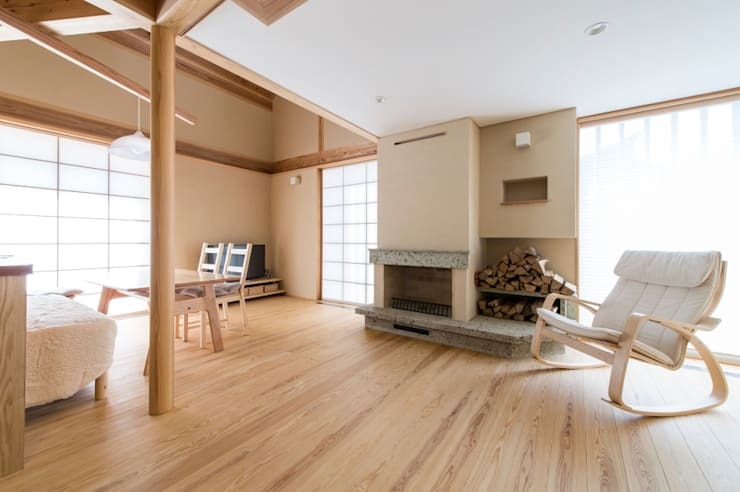 Many Japanese homes are made with a combination of wood types to create a very subtle sort of complexity to the interior design.Here we have an excellent example of just that! For more home ideas, have a look at the Kid-friendly wooden house with an inviting patio. What do you think of the bathroom in this home?